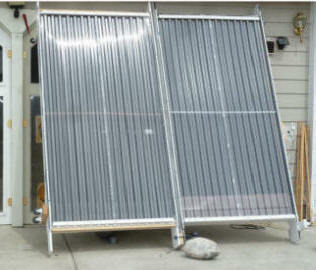 DIY solar air heating collectors for space heating can offer the best bang for the buck of any solar project I know of. They are simple and cheap to build and can have payback periods that are as short as one season. 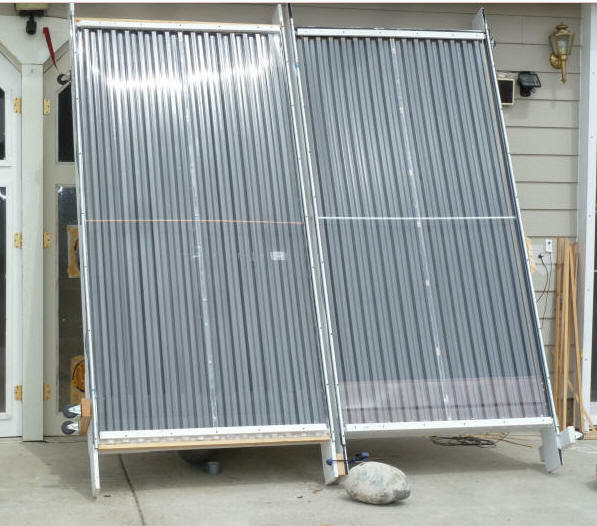 They offer a particularly attractive option to the Do-It-Yourselfer -- commercial solar air heating collectors with prices pushing $2000 can literally be built as DIY projects for $200! The biggest question facing someone wanting to build one of these collectors is to decide which of the many collector designs out there to build. Its fairly easy to look at the designs and evaluate construction difficulty and cost, but the big missing factor is the efficiency of each design. The aim of the test program described here is to test the heating performance of the common DIY collector designs in a consistent and accurate way in order to provide good performance comparisons. Its surprising that after all the years that solar air heating collectors have been around, there is little material available that provides objective comparisons of the various DIY collector designs, but that appears to be the case. There are also some relatively new designs for which there is essentially no performance data available. The method used was to build 4 by 8 ft prototypes of several different designs and test them side by side. Side by side testing of collectors eliminates a lot of the difficulties in doing good comparison tests of collectors -- if the two collector designs being compared are sitting right next to each other and aimed in the same direction, then the performance of the two can be compared in a pretty straight forward way -- you don't have to worry of variations in sun intensity, ambient temperature, wind, ... because both collectors are seeing the same conditions. In each of the side by side tests, a new collector design was tested next to the same baseline design collector that is the same each time. So, all collector designs were compared to the same baseline design (except as noted below). Heat output from a collector is directly proportional to the product of the (temperature rise through the collector) times the (flow rate through the collector). If two collectors are running side by side, and the airflow through the two collectors is adjusted to be the same, then the collector with the larger temperature rise from inlet to outlet is the more efficient collector, and the relative efficiency of the two collectors is in the ratio of their temperature rises. My partner in crime for this testing was Scott. We ran similar tests on similar collector designs and got similar results. This is the link to Scott's website with the details on his testing... Scott is also the founder of the Yahoo Simply Solar discussion group, and some of this air collector testing has been discussed there. Scott has put together a very good video that explains the basics of solar air collector design and testing... 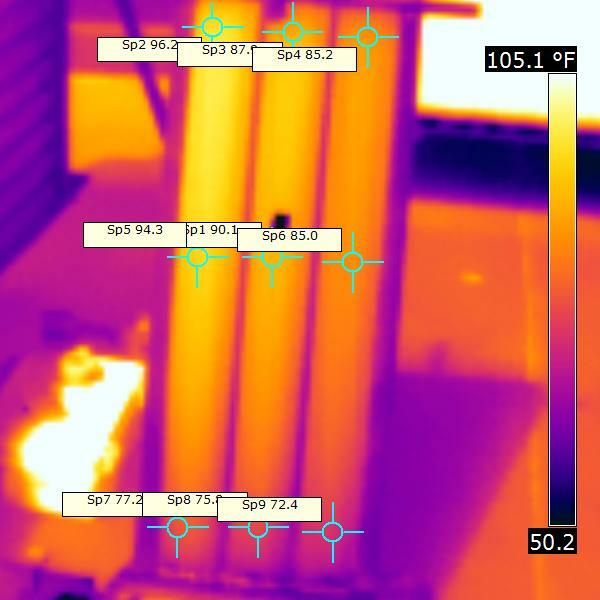 If you are a little fuzzy on what makes a solar air heating collector design good, this is a great video to watch -- all the Physics without the boredom. I am a bit hesitant about putting this first winters material up because of some variations and inconsistencies in the way I did the testing (see below for details). But, there is a lot of good information, and I've decided to make it all available despite a few warts -- just be sure to read all the cautions. The fact that Scott and I were able to independently come to the same ranking of the collectors makes me more confident of the conclusions. Hopefully next seasons testing will bring even more clarity to the DIY solar air heating collector picture. The links just below provide the details on each of the collectors and the tests done on them. The tentative conclusions for this season of testing are listed further down this page.